This innovative recovery solution is based on many years of experience during recovery, winching as well as many comments and request from participants of our Recovery Workshops. compliant to the highest quality standards and "Made in German"
to offer many more ways to use and operate it than just "recovery"
We assessed straps, wire ropes, ropes, winches, Tirfors®, Hi-Lifts®, chains, pulleys and so on and combined their advantages into this new and unique system. This system provides maximum weight-saving at an unsurpassed flexibility. You start to recover your vehicle over the pulling length of the chain hoist. Next you simply shorten the strap or rope and continue winching. No knots, shackles, tools required! The chain may be easily slung over vehicle frames, bumpers, trailer hitches, trees, even sharp rocks and is durable and long-lasting. Strap or rope provide an added flexibility to simply adjust to any required length during your work - fast and easy! A complete fotostory in terms of a demonstrated user manual can be found HERE (new window). The chain hoist and the shackles are certified to even lift or hoist a load, e.g. lifting your vehicle from a hole in the ground or simply change a wheel. No wire ropes are used that may cause destruction when breaking or are prone to damage when used at sharp edges. All components individually available as well! Our Premium Recovery Kit for lengths up to 22,5 at 3.2tons of pulling / hoisting force. If every single gram of weight is crucial! With as low as 21kg (including accessories!) 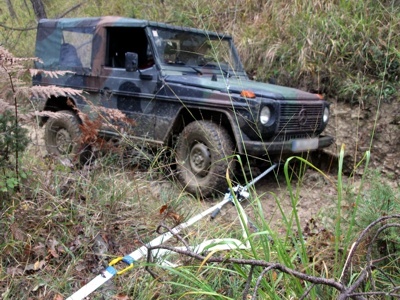 you have merely one-third of the weight of a classic wire-rope-winch - added by unsurpassed flexibility! Multi-Rope Dyneema® special rope, length 20m including tool-less, continuously length adjustment - may even float on water (patented) - Made in Germany! - 2,2kg - comes with bag 555,- EUR incl. 19% VAT. Accessory: Reduction rope w/ safety hook. Helps you connect to small receptacles like factory tow hooks. Consists of wire strap and safety hook, total length 480mm. Lifting max. 1ton, pulling max. 3.2tons. 49,- EUR incl. 19% MwSt. 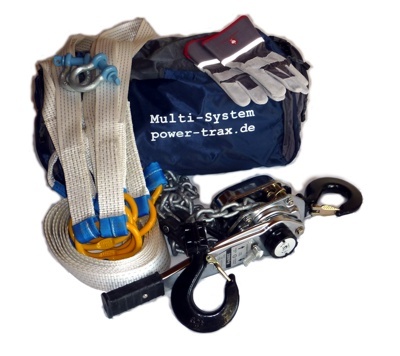 Allround Recovery Kit for lengths up to 17.5m at 3.0tons of pulling / hoisting force. Even this allround / budget set is less than half the weight of a conventional manual wire-rope hoist, weighing only 28,9kg including accessories. Its flexibility is an additional superior feature. 699,- EUR incl. 19% VAT. 599,- EUR incl. 19% VAT. Multi-Strap special designed strap, length 15m including tool-free stepwise length adjustment in steps of 1,5m (patented) - 6,0kg - Made in Germany! - comes with bag 330,- EUR incl. 19% VAT. Products and pictures may vary. Orders, questions and comments please via Mail.